Garnish ceviche recipes with tortilla chips or, as shown above, fried plantain strips. Photo by Food Colors | IST. This is Page 3 of a three-page article. Click on the black links below to visit other pages. We prefer a martini glass or goblet, because it’s easy to drink the delicious marinade (called tiger’s milk, leche de tigre). And don’t forge a lime wedge! Complementary wines include Albariño from Spain; unoaked or Old World Chardonnay such as Chablis from France; Grüner Veltliner from Austria; and Muscadet, Pinot Blanc and Pinot Gris from France are good starts. For something at a connoisseur level, try French Gewürtztraminer and Riesling. Cocktails are more ceviche-friendly, especially those made with lime (like a Gin & Tonic). Margaritas are terrific! 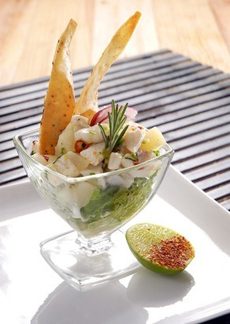 Lemonade or limeade complements the citrus in the ceviche. Feel free to mix in gin, vodka or tequila. Sparkling water with lime hits the spot. Iced tea with a squeeze of lemon or lime is perfect on a hot day.